The Internship Saga continues. This edition? AtelierSavas. Savannah Yarborough is the new, badass, entrepreneur of a woman I get to work under and I could not be more pumped. Sav studied fashion design for menswear at Central Saint Martins. If you know what that is, you can pick your jaw up now. If you don't know what that is, let me enlighten you for a moment. Central Saint Martins is the most prestigious and hard-to-get-into design school in the world. I'm not exaggerating. Stella McCartney, Alexander McQueen, Sarah Burton, Phoebe Philo, Zac Posen and John Galliano went there, to name a few. Anyway, Savannah clearly has had the educational experience of a lifetime, giving her the skill set to have the beautiful atelier she has today. "Think hot nights and whiskey on ice; the scruffy, decadent, pulsing electric energy of rock & roll." AtelierSavas came to life through Savannah's native, southern roots, her formal British education, not to mention her tenure as senior menswear designer at Billy Reid. Everything she does is inspired by life experiences, and her bespoke leather jackets are made to tell your life's story for you. Always one-of-a-kind. Starting out my internship with a bang: I get to work Tuesdays, Wednesdays and most Fridays so you’ll be hearing from me quite a bit. Its a beautiful Tuesday morning in Nashville, and I'm headed to my first day of work at AtelierSavas in Cannery Row. I start at 10am, and I've got my planner, my laptop and my camera just in case. I've got a few ideas already, and I can't wait to see what Sav will have me do! I started my day at Franklin Juice Co for some açaí because that’s a sure fire way to have a good first day. I get to AtelierSavas over 30 minutes early because that’s just me in a nutshell. I sat in the parking lot sipping on my cuban and looked at downtown just thinking about how dang cool it is I get to intern here! Today was a big day for organizing photos. I went through dozens of folders and arranged them by male & female clients, embroidery, atelier interiors, and photos of Savannah. After this, I took some video on my Sony 6500 and made an Instagram story for AtelierSavas. You can catch it on their Instagram on the Atelier highlight! My next task was to begin making travel notices for Savannah’s many trips. I played with some leather textures and I’ll be sure to show you all them as I finish them! Side note: Savannah has a dog named Scott and he’s the cutest little nugget that makes any day brighter. Wednesday: Another day, another day I'm super fricken early to work! I am supposed to start at 10, but I actually went in at 9:30 because might as well. I even got gas and went to Proper Bagel for breakfast! Right when I got in, I finished up those travel notices and began working on making an Instagram story. The first one I made was of Scott, because, well, who doesn't love Scott. After that, I began taking some snapshots of what's going on today; Savannah working on some embroidery for Elle King and the Brethren. That's it for my first week. Catch you here again on Tuesday! On Wednesday, I created a means of planning out instagram posts for AtelierSavas using the service, Planoly. Through this service, you can upload photos, create captions and schedule when posts are to be sent to instagram. It can even post them for you, which is super convenient for her since she's very busy. I added about 30 photos to her upcoming feed, and scheduled out every day for a little over a week so she doesn't have to worry about a thing. We also all watched the most recent gold buzzer video on X Factor and shed a few tears as a group #bonding. I continued to work on the postcard designs, and am just waiting on a few custom sketches from Savannah to add to them. To close out my day, I made an instagram story of the showroom and used a little bit of Lou Reed to accompany the scenes. Last night I got the best rest I've had in a while, so much that I woke up feeling ready to go at 6:30 am (what). I was out of my house at 7:45, got to Franklin Juice for açaí at 8, and to proper bagel to grab my to-go lunch and a coffee at 8:30. I went into work at 9, an hour early, because I was just extra ready this week I suppose. My first task was to move and add to Savannah's leather wall. She had it originally behind the computer desk, but we moved it to a more central wall. She had also finished many more jackets since the wall had last been added to, so I went through boxes and swatched several more pieces of the leftover leathers from past jackets. Savannah is having an event at a luxury car dealership tonight, and I also had to help prep for that. Activities included polishing and cleaning her brass stands, rolling up the skins, and hanging the jackets she's bringing with her in garment bags. Who wouldn't want a custom jacket to go with their new luxury car? Quickly, I made one last flyer to inform those on her mailing list that she's coming to Detroit and NYC so she could inform anyone who may not be on social media. To wrap up the day, I helped out Brett Warren as he photographed the newly finished jacket, and I made an Instagram story about what he was doing. Happy Wednesday. Today I finalized the masculine postcards. Savannah finished a sketch this morning and I was able to wrap up what I had begun last week. I've attached them below! Along with this, I designed tissue paper and shipping boxes for her to use, and I'm so pumped about them (especially the boxes, I'm a sucker for packaging). The tissue paper is black with her signature dots in a gold metallic ink. I want a jacket just for the packaging (jk, I just want a jacket in general). I got to watch Savannah have a few fittings today as well. The first was a finished jacket for a male client. It needed a few armhole adjustments, but he absolutely adored the jacket. The second was the first fitting for a woman, meaning she had a muslin toile of her dream jacket. She loved it from the start, and the fitting went really well! They discovered princess seams down the front were a good solution, and made a few changes to the buckles. Wednesday when I left, Savannah was feeling really under the weather. Friday when I came in at 9:30, she was almost done with a jacket she began making for herself on Thursday. Needless to say, she's feeling much better! The jacket is, of course, breathtaking. I followed her along as she finished making it and kept up with Instagram stories (under the "The Process" highlight) and even made her first IGTV post (a whopping 40 seconds long). Check it out on her Instagram page, and click the little IGTV bubble! We certainly had to document the day by having a mini-photoshoot outside with her new baby and Scott, so you can take a peek at some of those in the gallery. Y'all, how is it that I'm already halfway through this internship? Anyway, remember how I made those travel notices for Savannah? Well this week, she's taking those trips! She left me plenty to do while she's away, and I started with scheduling out some Instagram posts for the next week or so. 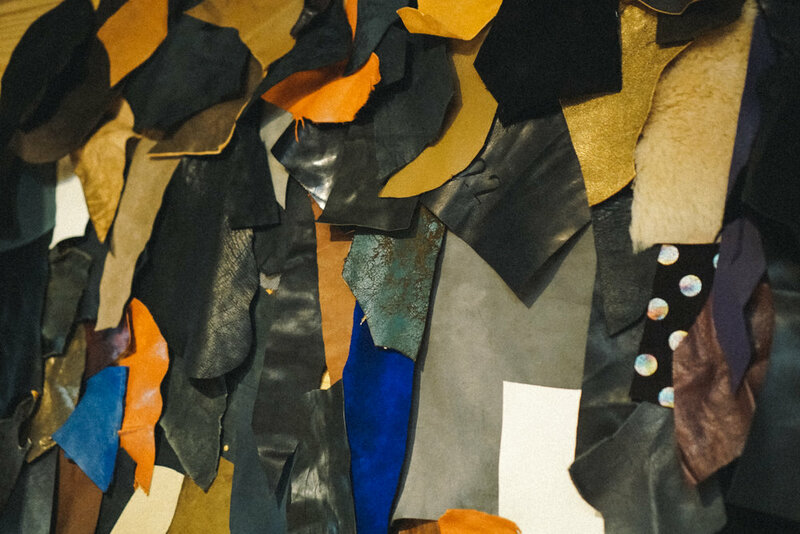 Following this, I began sorting through and organizing the plethora of leather swatches and samples Savannah uses to allow clients to pick the leather they want their jackets made out of. I distributed the leather into envelopes by brand, color, and whether it was leather or suede. They were all mixed in a plastic bin before, so this is much easier to navigate. I also helped set up the showroom for an appointment with one of Nashville's biggest celebrity stylists. Savannah is going to be making several custom leather skirts for a well-known bombshell's upcoming tour (so cool). I laid out several stretch leather swatches on the glass table in the showroom with a measuring tape and a notebook to prepare. Wednesday began at Edgehill Cafe where I grabbed Savannah a coffee and a BEC sandwich before she began her road trip to Austin. She gave me the last sketch I needed to complete the feminine postcard before she headed out so I was able to finish that first thing. After I finished up designing the feminine card, the masculine postcards arrived in the mail! I'm so happy with how they came out, and I'm glad even when I'm finished interning at AtelierSavas I will have left my mark. After Savannah left, I packed up several skins to be shipped to the man who makes all of the crossbodies, duffles, clutches and tote bags. These boxes are not light. Stay tuned for some shiny new things coming soon to AtelierSavas. Friday when I came in, AtelierSavas got some exciting news! The music video for the tiny, new, country firecracker, Tegan Marie came out, and it's featuring a custom white leather suit from AtelierSavas. I downloaded it and made a short clip for the instagram, which you can see on her account. Otherwise, catch the whole video here! New Taylor Swift much? Today I also photographed my best friend, Macy, in an AtelierSavas jacket for Savannah to use as she pleases. The photos you see here are from my DSLR, but I also took some on my film camera which will come later (PSA: cigarettes were edgy lil' props; I 10/10 do not recommend smoking). Also, turns out after I took a few photos on my film camera, it jammed up, so we may or may not see them later. I'll keep you updated. This week I’m only working on Monday and Thursday. Why, you ask? Well Tuesday is my 22nd birthday, Wednesday is the 4th of July, and Friday is my family’s annual summer trip. This year, we're going to Colorado, and you can read all about that in another post. Monday: When I got in, I saw that the tissue paper I designed came in, and it looks beautiful! I'm so excited for Savannah to send off a jacket or a bag to someone so she can show off her new postcards and tissue paper. The shipping boxes arrive next Friday, and I'm really looking forward to seeing how those came out. After I rolled up some skins, we got news that Tracee Ellis Ross is going to be wearing an AtelierSavas sample jacket for an InStyle article next month, so I had to take some quick photos so she could choose one she liked (how cool)! Turns out, she selected three, and I had to pack them up in a box to be overnighted stuffed with the new tissue paper! Following this, I began a spreadsheet to keep track of all the sample jackets and their locations that I will continue to work on later in the week. Mid Week Update: On my birthday, something really exciting occurred! Belmont posted an article about me under their "Student Summer Success Stories", and you can read it by clicking that snippet! On Thursday when I came in, Savannah was in a meeting. She had me run to textiles to get her three black tape 7" jeans zippers with brass teeth and some hook & eyes. I'm not sure what for yet, but I happily obliged. When I got back, I finished up the spreadsheet I began last week that keeps tabs on all the sample jackets, their worth, and when they're being loaned out. I also gathered research on a new product Savannah is going to develop at a more affordable price range, so stay tuned! Along with all of that, I got to document the process of Savannah making that leather skirt we talked about earlier. However, the most exciting part of the day was creating a story and a post to announce AtelierSavas' first giveaway! I'm certainly going to be partaking, as should you! Check out her Instagram for all the details. Happy Friday! Yesterday I got back from a trip to Colorado with my family, so I only worked one day this week. Needless to say I'm tired, but a girl's gotta do what a girl's gotta do. I did my usual routine today: grab acai at Franklin Juice, run to Proper Bagel to grab myself lunch and a coffee, and head over to Belmont to work on campus before heading into my internship. When I got in, I saw the boxes I designed for jackets to be shipped out in, and I'm over the moon with how they came out. They look so aesthetically pleasing, and I would love to receive anything in a package that beautiful. Savannah relayed an issue she's been having with her brass jacket stands to me, and explained that something needs to go over the end caps so they're not abrasive to the jackets. After a few trial and error sessions, I discovered shearling would be the best option, and I used double-sided foam tape and heavy thread to ensure the shearling stayed put. Savannah had several meetings today as well. Two with clients, and one with a woman who is going to be helping her make a custom scent for the atelier, and for her to give to clients. The scent has yet to be named, but I began designing a label for the bottles today. I'm sure I'll finish it up next week once she has a name and all the ingredients in a list form. It's another Tuesday at AtelierSavas. When I got in today, I designed the packaging for a small shipping box for smaller leather goods, bags and accessories. I then applied the shearling end-caps to all of Savannah's hanging racks like I did for her stands last week! This isn't a hard task, but its quite time consuming. After that I cleaned up my mess and tidied up the showroom to prepare for a toile fitting for one of her clients. This is the second toile fitting and essentially the second step. The client came in and got measured, established a design, a muslin mock-up was made, and is tried on by the client. A few adjustments are made on the toiles, and once it is finalized, Savannah is given the OK to proceed on leather. Savannah had a woman come in and discuss feng shui and how it affects your mood, your work ethic and everything in between, and on Wednesday we put it into place. We threw a ton of stuff away, moved and rearranged furniture and tidied up like there was no tomorrow. Feng Shui is very interesting to say the least. There are diagrams you can research that explain certain shapes belong within a specific square footage of every home or space. Circles belong in the showroom, and triangles belong in the office. Super specific! Holy cow. This summer has flown. Internships make it go by really quickly! For the past few weeks I've started my day by getting breakfast, coffee, and a lunch for later, and then I head to Belmont and work in the JAAC for an hour before heading into the atelier. I plan my day/week out and it lets me wake up and get my day going before I have to get down to work. Today is going to be a fun day as we are having London Woodberry from Nashville's USL soccer team come in for a photo/video shoot. I'm taking all the images and Christian is on video! We've been really into soccer recently so it's going to be a good time. London was such a cool guy, and so good at soccer tricks! He can juggle like a champ, and can balance the soccer ball on his head, neck and foot! It was really cool to be able to photograph him in action. He even gave Christian and I tickets to Wednesday's soccer game! Wednesday started like Tuesday did, except I got breakfast with my mom at Proper Bagel! I then moved on to work at Belmont for about an hour before work as usual. When I got in, Savannah had me find larger pieces of leather and suede from these little swatches she had pinned to a board. A man is coming in to pick his made to measure leather! This will be Savannah's first M2M jacket, as opposed to her usual bespoke jackets. After this, I created a testimonials page for her website. I had to dig through many, many emails to find them, but they're raving, genuine responses from her customers, which is important! You can see it here. Savannah also finished up another client jacket, so I was able to take some photos of it and the gorgeous sugar skull embroidery. To close out my day, I rounded up some jackets for my girl Corrine to pick up for a photoshoot she's helping with tomorrow! Corrine is a superstar fashion girl who works for Nashville's best stylist, Tiffany Gifford! I'll link Corrine's insta here so you can give her a follow. Holy crap! I can't believe the end is so near. I can't believe I'm nearing my final semester of undergrad! This is all so surreal. Savannah went to a really cool event last night at the Fairlane to see what her boyfriend did for them. He owns a sign company in Nashville, and almost any round bulb sign you see in town, he made. Barista Parlor, Imogene + Willie, The Fairlane's skyline sign, Noelle, and many more. He's so talented! Today was a quiet day at the atelier. Everyone was beat from the event last night so things were moving a little slow. I ran to the Restaurant Depot to get Topo Chico for the shop before eating lunch (an absolutely delicious bagel-wrapped hot dog from Proper Bagel). I wrapped up a few more things for Savannah, and had a really great conversation with her about her journey through college to now, and I was really inspired! Stay tuned for the final chapter of the second internship saga. My final week. My final internship. Leading into my final semester of undergrad. Life is weird and it flies by! I'm a nerd, though and can't wait for graduate school (I'll be applying as soon as the application opens, lol). To start out the week I met with my girl, and fellow intern, Alison for some açaí at Franklin Juice, and then we moved the party to Proper Bagel for some scheming over coffee. You can find her ever-so-chic instagram here. When I got into work, I began digging through images for Savannah's new branch of her business, Savas Maison. 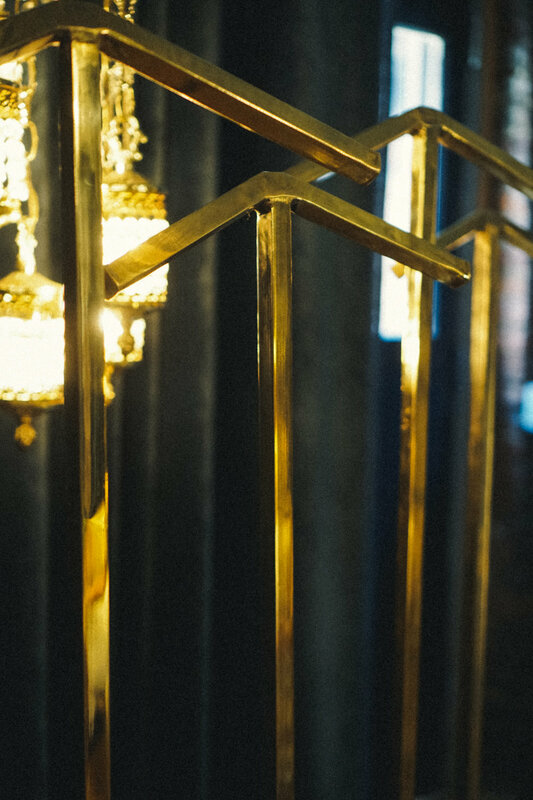 What many don't know is that Savannah is also an interior design wizard, and has done a lot of beautiful work around Nashville and beyond. She made an instagram for this new side of her, and you can see it here! In a funny twist of fate, Libby and Katy, from my last internship came over for a meeting about a pop-up event that may potentially be held at the atelier. After that I took a few photos for Savannah's instagram and story, and that wrapped up my Tuesday. I cannot believe my final day at this internship has arrived. When I got in, Savannah surprised me with a gorgeous leather AteleirSavas crossbody! I was elated, and I had to take photos of it! The rest of the day was devoted to documenting Savannah as she created the first made-to-measure canvas. All of the made-to-measure jackets are her own designs, which really excites her, as she doesn't often get to make jackets she truly designs. All of the custom ones she clearly designs, but they're very much based on what the client wants, which isn't always her taste. She can really whip canvases together; I was so blown away! In conclusion, I think its safe to say I had two of the coolest internships in Nashville. They both provided me with knowledge I wouldn't have gained in a classroom, and helped me create a more solid idea of what I may want to do for the rest of my life. Isn't that all you want to figure out as a 22-year-old? That's all my family wants to figure out at Thanksgiving dinner, that's for sure. Thanks to these internships, I'll actually have an answer for my family, and tons of stories to share.